On-campus, Christ-centered organizations allow students the opportunity to connect and grow in their faith alongside their peers. MBU’s FCA huddle meets at 7 p.m. every Thursday in the North Hall lobby. Junior Meredith Linn, history major, and senior Ethan Metzler, physical education major, encourage students to attend FCA for food, fun and fellowship. Linn is a member of the women’s lacrosse team, and Metzler is a kicker for the football game. FCA stands for Fellowship of Christian Athletes, but the organization ultimately represents something much greater than the acronym implies. Through camps, huddles and events, FCA combines faith and athletics to influence people worldwide. Huddles are small group Bible studies/devotions for coaches and athletes, and many schools throughout the nation have huddles for their communities of student-athletes. Missouri Baptist University has an on-campus huddle led by junior Meredith Linn and senior Ethan Metzler. Linn and Metzler are huddle leaders, so it is their responsibility to choose huddle meeting topics, lead conversations, promote the organization and plan food and activities for each meeting. The huddle meets at 7 p.m. every Thursday in the North Hall lobby, and newcomers are always welcome. Metzler, a physical education major and kicker for the football team, said meetings typically begin with an icebreaker of some sort, followed by a dive into discussion on the topic of choice. The ministry of FCA has had an impact on the lives of thousands of athletes — Linn and Metzler are no exception. Metzler, who has been involved with FCA since the spring of 2017, said it’s been a blessing to be a part of the group and have the opportunity to interact with fellow Christian athletes. Linn described herself as being a lukewarm Christian before becoming involved with FCA. 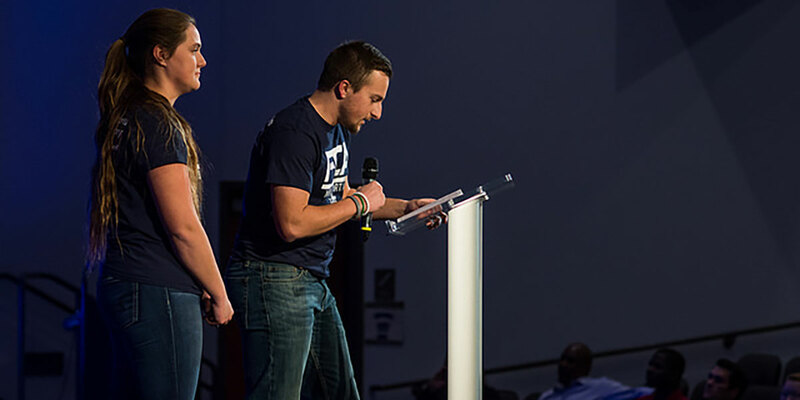 MBU’s FCA huddle leaders have seen the ministry influence the lives of those around them as well, through both huddles at their schools and the camps offered each year. Both Linn and Metzler want to encourage anyone — collegiate athletes or otherwise — to come out and join the huddle. “All anyone has to do is come and hang out with us on Tuesdays,” Metzler said, adding their email addresses are: 1443297@mobap.edu and 1553074@mobap.edu. You can also find MBU’s FCA on Instagram (mbu_fca) and Twitter (@MBUFCA). Alumni Will Harrington is an area rep for St. Louis, and he has the opportunity and responsibility to equip, empower and encourage coaches and athletes in their walk with Christ. Harrington breaks down FCA in three simple words: food, fun and fellowship. Stacy Rohan is Lead Editor for MBU Timeline. Majoring in journalism with a psychology minor, Stacy holds many goals for her future; Publishing a novel and becoming Lead Editor for a professional news outlet are at the top of her list.